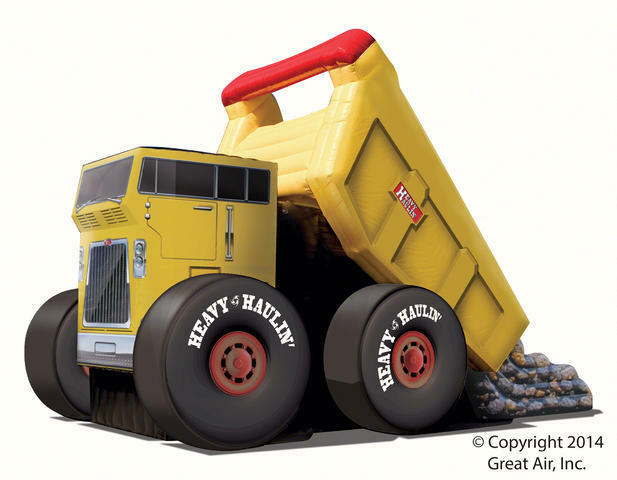 Drive off to the quarry with this towering, mighty machine! This Heavy Hauler Slide features a wide slide lane that seems to go on forever,enough to appease the adventurous engineers of any age. Realistic digital artwork captues the heart of the big mover. Its huge wheels deliver fun wherever it is set up. It features an inflatable safety ramp at the entrance to protect excited kids as they scramble to get inside the bouncer. Recommend 3 kids at a time, one sliding, one climbing and one entering. This unit must be staked or tied off for safety, otherwise water barrels must be ordered.